In 1825, entrepreneur Deming Jarves arrived in Sandwich to build his glass making operations, the Boston & Sandwich Glass Company (B&S). It had an immediate impact on the town and converted it from a small farming community to a thriving industrial place. There was a very positive effect because it provided lots of good paying jobs, increased the population of the town and provided tax revenue that would result in town improvements. Sandwich was the manufacturing center and Boston was the distribution center. 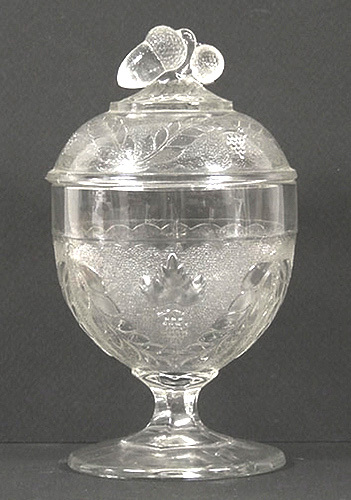 The B&S was producing 100,000 pounds of glassware per week and transported the output to Boston using small packet sailing ships. Jarves did not make idle threats and ordered the construction of a steam and sail ship which was delivered to Sandwich in 1853. Its Captain was Roland Gibbs of Sandwich. When it steamed into Sandwich Harbor and the fog lifted, all could see the name of the ship marker affixed to her bow. He had gotten his revenge and smugly called her the Acorn. Also, the acorn and oak leaf cluster was one of Jarves’s favorite motifs for decorating. The Acorn made about two round trips per week to Boston taking both freight and passengers on board. Ironically the Acorn was not a good investment for the B&S and after Jarves left the company in 1859 the Board of Directors completed a successful contract with the railroad and all freight from the glass factory was taken to Boston by rail. 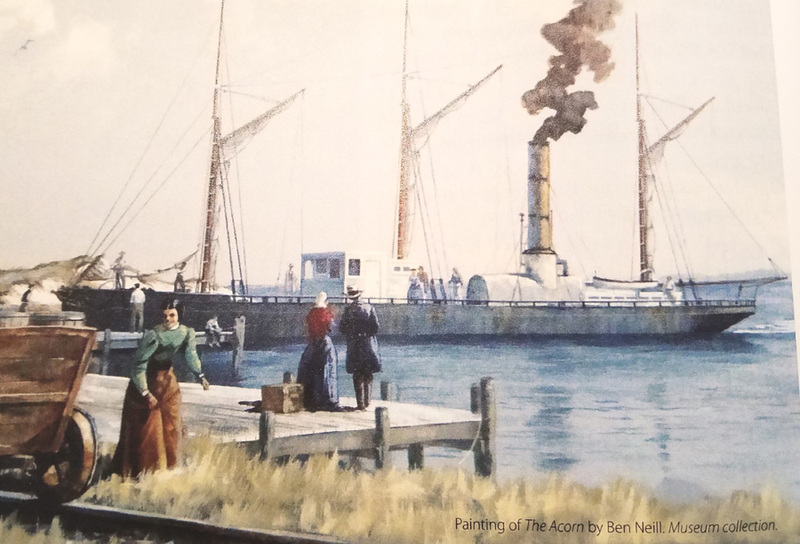 Without a need for the Acorn, it was sold and for approximately four years it served as a steamer for the Provincetown/Boston route which was about a 5 hour journey. Capt Gibbs (1806-1867) continued in command of the vessel. By 1862 it was sold again to a New York firm and it ultimately ended up as a ship for the Union Navy during the Civil War. In a sad ending, it was sunk by Confederate forces off the coast of the Carolinas. But the name of the Acorn lives on because today it is the name given to the publication produced by the Sandwich Glass Museum. Sandwich, A Cape Cod Town by Russell Lovell Jr. This entry was posted in Articles, Glass Factory, History of Sandwich. Bookmark the permalink. I need help acquiring historical coastal images of Quincy, Hingham, Marshfield, Plymouth, and Sandwich including harbors, beachscapes, lighthouses and sailboats to grace the walls of a prominent financial office in Norwell. They have requested these location-specific prints to honor their heritage, but I am having a hard time finding them. None of the images from online are high enough resolution to enlarge to 18″ x 24″. Can you or anyone help me find images like this or point me in the right direction?